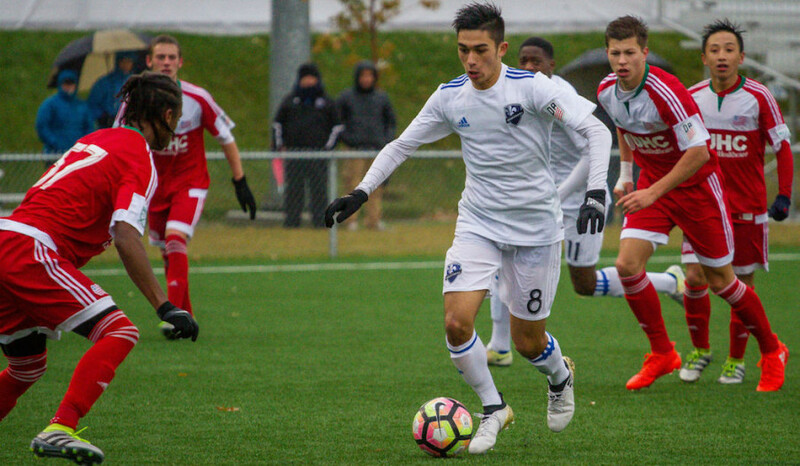 Playing in the United States Soccer Development Association, the Montreal Impact under-18 team is getting ready for their big summer challenge. The cohort will travel to Westfield, Indiana to participate in the USSDA playoff group stage which will take place from June 22-26. The Impact u18s will be the only MLS academy team in their group, however. The team was drawn, along with two other private soccer academies: Sockers FC of Chicago and Texans Soccer Club of Houston. Sacramento Republic’s academy, from the United Soccer League—a league one tier below MLS—rounds up the group. It was a fruitful year for the Impact u18s in the USSDA. Finishing second in their group, striker Gabriel Balbinotti raised eyebrows, collecting 21 goals in 20 games. The Montreal native, who spent his time between Porto Alegre, Brazil, Trois-Rivières and his hometown, played in a diminished role last season as a 17 year-old, but has since emerged as a force for the team. The USSDA playoff group stage in itself is tough task for the young players. There are three games to play in the span of five days and the first of each group gets to go on to the elimination stage. The Impact have had good results in recent USSDA history. Of note, a third and a fourth place finish on their recent résumeé. Neither Balbinotti or Choinère consider the Impact’s recent successes to be added pressures. With the ambition of becoming the first Impact u18 team to win a USSDA title, they’ll travel to Indiana this week in order to arrive with two to three days to spare. On the individual level, the two players have different objectives. While Choiniere has one year to go with the u18 team, Balbinotti will compete in the USSDA playoffs for the last time. Having finally arrived at the last step of the Impact’s academy system, the striker wants to take advantage of his last games before looking at his future and the potential of signing a contract with the senior team. “For now, I try to concentrate on finishing the season with the u18s, that was my objective from the start of the year,” said Balbinotti. “I don’t get too worried about this. I try to take it one step at a time and what will happen will happen. 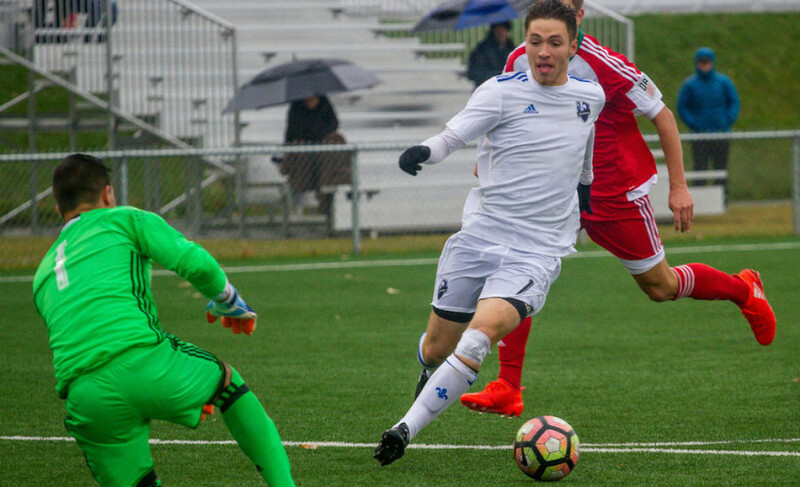 With the Impact academy pledging to loaning out some of its players, Balbinotti also has the chance to represent Quebec at the Jeux de la Francophonie—a sporting event regrouping Francophone nations. The 18 year-old relishes the opportunity to embark on the journey to Abidjan in the Ivory Coast, where the event will be held. On the national level, Balbinotti represented Canada at the u15 level but has not worn the red and white since. He thinks that making a case for himself in the national team setup is also an important step. “It’s an objective of mine and this year I tried everything to try and get to it. But I think I need to continue pushing to improve and then maybe get there,” Balbinotti said. As for Choinière, who’ll have another year with the u18s still to play, his goal is to sign a professional contract with the Impact as quickly as possible, but also recognizes that it takes time. David Choinère, Mathieu’s older brother, was the first player to sign a professional contract from the Impact’s now defunct United Soccer League affiliate, FC Montreal. The younger Choinère doesn’t hide his desire to play with his sibling. The Impact u18s will play their first game of the USSDA playoffs on Thursday, June 22 against Texas Soccer Club Houston. They will then play Sacramento Republic FC on Saturday, June 24 and finish off the group stage on Monday June 26, where they will play Sockers FC Chicago.